The Fragment Sizes view is available in the Document window after using the File > New Agarose Gel command. The view initially appears empty, or may contain one or more faintly outlined boxes. After setting up an agarose gel simulation, the view is populated with columns, each representing a lane in the Gel Simulation view. Fragment lengths are shown in base pair (bp) units. The column headers show the marker(s), enzyme(s) and/or primer(s) that have been applied to each lane. 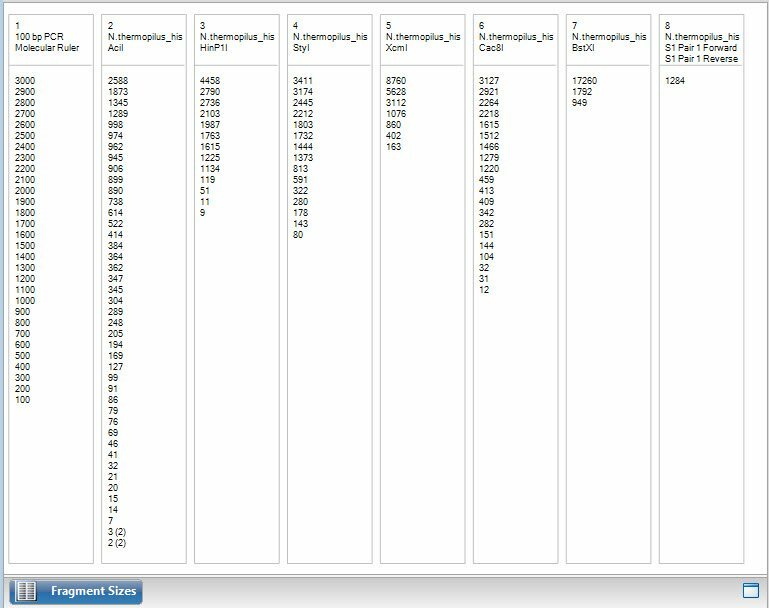 The following table shows tasks pertaining to the Fragment Sizes view. Select a lane Click anywhere in the lane. View information about what has been applied to the lane Hover the mouse over the lane to reveal a tooltip. Select a fragment and its range on the sequence Click on a fragment size notation. The fragment is shown in red, and the footer is populated with information about the selection. Any fragment from the same sequence as the selected fragment, and which overlaps the selected fragment in any way, will appear in blue.